Many say that Mustang Stadium at Sweetwater High School in west Texas is the best in all of Texas. It’s hard to disagree with that assertion. The Mustang Bowl, which opened in 1939, will celebrate its 80th anniversary next year. Quite honestly, former Sweetwater head coach Shane Mobley, now at Sealy (outside of Houston), told me about the incredible stadium and Sweetwater tradition on the High School Football America Radio Show in 2016, but until I saw this landmark stadium myself, I couldn’t appreciate its true majesty of this piece of high school football history. The stadium was built by the Works Progress Administration for $65,000 with an original seating capacity of 7,500 fans. Sammy Baugh didn’t play in the Mustang Bowl, but Slingin’ Sammy, who will be profiled in my upcoming book High School Football in Texas: Amazing Football Stories From the Greatest Players of Texas, is still the town’s most famous resident. Baugh, who is a member of both the College and Pro Football Halls of Fame, moved from Temple, Texas after his sophomore year. He played at Sweetwater’s Newman High School. Baugh is one of two Sweetwater natives enshrined in Canton. Clyde ‘Bulldog’ Turner also played in Sweetwater pre- Mustang Bowl in 1934-35. Baugh’s No. 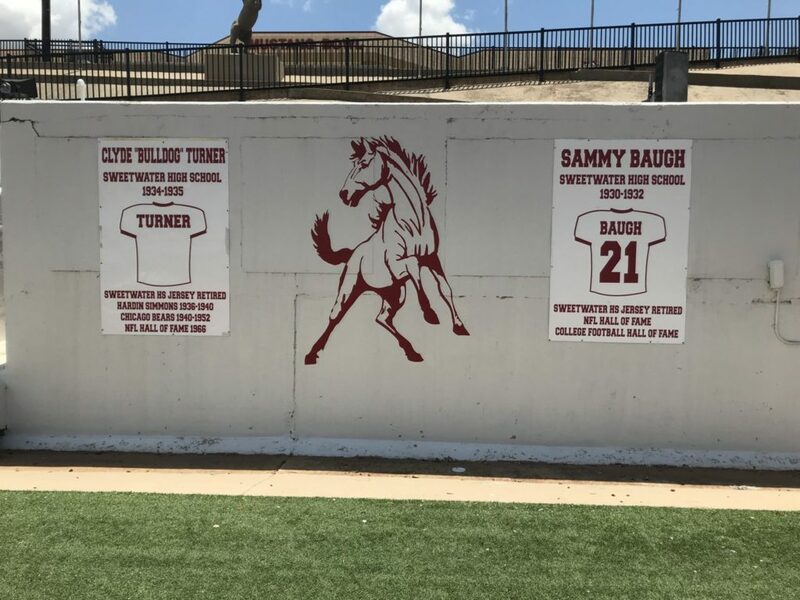 21 has been retired and are both are honored inside the stadium.